Reading last December’s Year End Review, I’m amused by the measurements I used in measuring success. 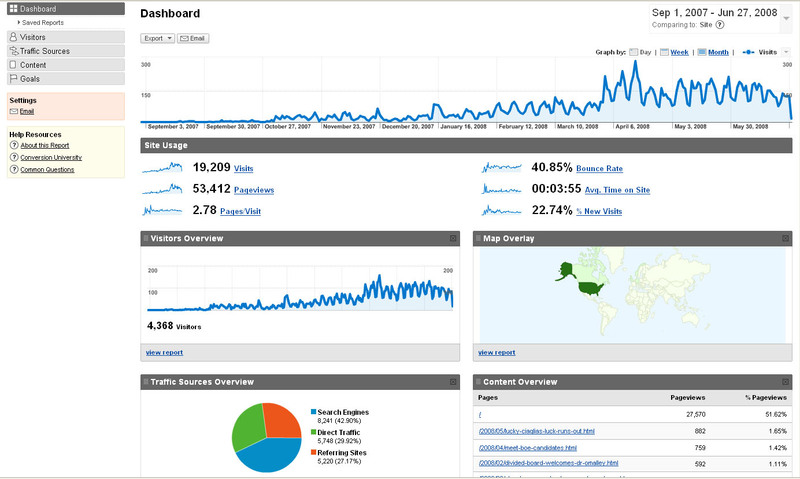 “[O]ver 400 unique visitors and nearly 4000 pageviews.” Truth is I was using the numbers that put me in the best light. Six months later, Aberdeener.com has accumulated over 4,000 unique visitors and over 50,000 pageviews. To be honest, I have no idea who these 4,000 unique visitors are. 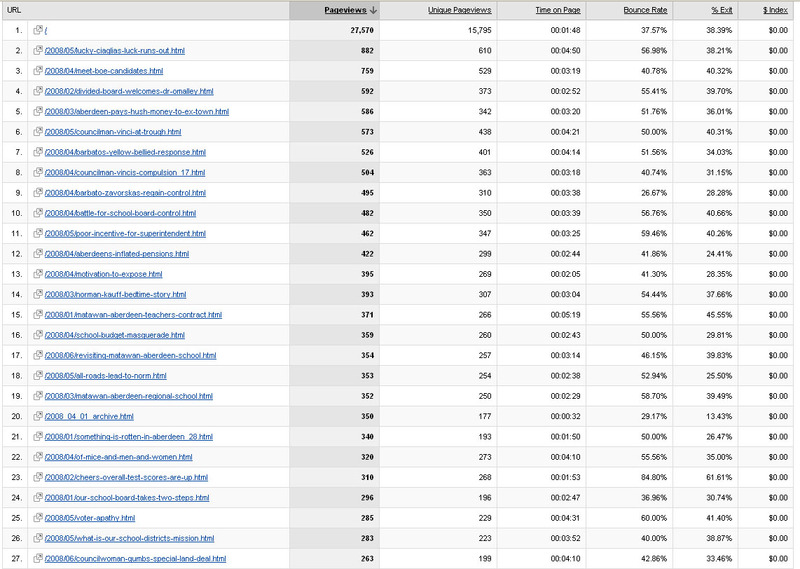 Half of the pageviews are the index page. My best guess is the blog regularly reaches 250 homes in Aberdeen of which only 150 are dedicated readers. How am I doing? I think I’m doing fine. Rather than play pretend, I’ve posted screenshots of the most relevant stats. To this day, over two-thirds of visitors arrive at the site through a search engine or a link on another website. Despite recurring stories of people hearing about the site, or at least its contents, through the grapevine, I’d bet over three-quarters of the residents have never heard of Aberdeener.com. Even among our readers, less than half return to the site on a regular basis. But this website isn’t a business. I don’t measure its success by readership, revenue (zero), or brand recognition. The blog has a simple mission – To be an arena of ideas for improving our quality of life and lowering our cost of living. I measure success by the impact the blog has had on the township. There’s no way of knowing whether the blog has prevented something from occurring but we can certainly see the things it hasn’t prevented. Soaring expenditures in the school district and the township, giveaways to CME Associates, and a business-as-usual mentality. The school district’s single success, appointing a capable and reform-minded superintendent, was due solely to a temporary change in leadership and is now opposed by a majority of the school board. Even the Greater Aberdeen Garage Sale owed most of its success to our local reporters, in particular Erin Stattel of the Independent. Since the new policy requiring comments be posted under an alias, there’s been a dramatic drop in the number of comments. I have also been a bit less aggressive in my reporting during the lazy hazy days of summer. However, I hope to lift the new policy and resume my normal reporting by the end of July. Yet, there’s no denying the potential to effect next year’s elections. With $5,000, this blog could likely defeat any incumbent candidate in next year’s elections through newspaper ads, mailings, and signage, plus highlighting the most damaging articles on the homepage. Wrong or right, does any candidate seriously want to challenge the notion? Even my adversaries have stopped criticizing me. In the early days, there was name-calling and attacks on my competence as a blogger (some of it warranted). Today, however, I try to stick to documented malfeasance and post the source material. You can argue with my opinions but who can argue with the facts? Even on the Ciaglia story, the most read, most commented, most heated article on the blog, not one person tried to suggest the builder did not receive preferential tax treatment. Despite the low readership among the locals, each one of our elected leaders reads this blog. Like myself, they too recognize that times have changed and what was once commonplace will soon be rebuffed. I do have one regret – to a large extent, this blog has become the voice of one person. Our town is fortunate to have people far more knowledgeable and capable than I and I wish they would be more pro-active and share their ideas on how we can improve our neighborhood. I believe change is in the air. I believe in the people of Aberdeen and our neighbors in Matawan. I’m proud to be a resident. And I’d like to thank everyone who has helped me be a part of this neighborhood. Lots of room for improvement but I’m confident we’re moving in the right direction. As for this blog, I think it’s doing fine. >>> Read more! People fear a recession for two reasons – oil and housing prices. Oil is over $135 a barrel – at a national consumption rate of 21 million barrels per day, that’s over a trillion dollars a year. S&P/Case-Shiller reported this week that home prices in 20 metropolitan areas dropped 15.3% from just one year ago. The good news is that Aberdeen Township has weathered the situation fairly well. If we had political leadership, we could do even better. Based upon anecdotal data, I would guess that, over the past two years, home prices have dropped about 15-20% with the newer homes suffering the larger declines. Of the fifteen homes sold in May 2008, only one house sold for more than $400,000 – a house on Dogwood Ct., barely four years old, sold for $470,000. At the same time, foreclosure proceedings were initiated against 9 properties (out of about 7500). That’s around half the state average of 1 in 467 during the same month. Ten properties are on the sheriff’s block. Unfortunately, both the township and the school district have chosen this moment to go on a spending spree. The municipality has increased spending 15% while day-to-day operations at the school district has risen 6.4%; our elected leaders believe the more money we give them, the better off we are. Still, assuming the township and school district don’t want to drive us into bankruptcy, what could they do? First, cut spending. Matawan’s Police Chief McGowan’s retirement gave the two municipalities a perfect opportunity to merge their police departments, saving on salaries and capital spending while increasing security. Heck, we should merge Matawan and Aberdeen. The best time to cut spending is now! Next, the library should sponsor programs on how to help residents from losing their homes. The Aberdeen Township Council could also state their intent to not force anyone into foreclosure as a result of tax delinquency. Long term, we need to focus on reducing the tax burden and raising the town’s desirability. According to Zillow, the town’s real estate has been rising and falling in lockstep with the county. We can do better. From improving our schools to developing Main St. and the train station, we can do much better. Another point to remember is the inverse relationship between taxes and property values. Each $360 rise in property taxes costs us an additional $5000 in home equity. In the past five years, property taxes have risen an average $1600, signifying a $22,000 (5.5%) loss in value from the average home. For people struggling to keep their homes, that equity could have made all the difference. In addition to cutting spending, the municipalities and school district should be investigating alternative revenue sources, from public/private grants to corporate sponsorships. Ultimately, our public servants need to recognize that, more often than not, the people would be better served by being allowed to keep their money. >>> Read more! Before we can have an honest discussion about how to improve our schools, we need to lampoon several myths that have risen to the level of “common sense”. Myth #1: A student’s failure is the fault of his home environment. This is the number one refrain we hear from the educrats – don’t blame the teachers, they can only do so much. Imagine there’s a train wreck because two rail workers were asleep at the switch. Who’s to blame? The engineer and the rail workers were each relying upon someone else to do his job. The answer is they’re all to blame. Had any one person been properly doing his job, the crash would have been avoided. The remarkable thing about the educrats’ argument is that, while refusing to accept responsibility for failure, they’re quite eager to take credit for success. Meanwhile, if they were quicker to accept responsibility for failure, they’d be more likely to achieve success. To demonstrate how broken the system is, let’s look at Holmdel, an educrat’s dream community. In 2000, the median family income was $122,785, 60% higher than Aberdeen’s $76,648. The student body is almost entirely white and Asian. The district acts as a magnet for families who want, and can afford, to give their children an excellent education. The school district has all the ingredients for success. How’d they do? On the New Jersey State HSPA exams for 11th graders, only half scored above 75% in language arts literacy, only a third scored above 75% in math, and only a quarter scored above 75% in science. How is it that an educated parent body would tolerate such a failure rate? Because after years of being conditioned to defer their judgment to the “experts”, they’ve been bamboozled into believing their kids are receiving a top notch education. After all, when teachers send the students home with underserved A’s and B’s, who are we to challenge their judgment? If we ever tested our students against their international peers, it would mark the end of the government monopoly on education. Myth #2: Students are the district’s primary concern. Oh, how I wish that were so. In the past 10 years, not a single tenured instructor has been terminated. The school administration has made it crystal clear that they will not pull a tenured teacher out of the classroom, no matter how poor a teacher he is, unless he commits a crime. Robbing a child of his opportunity to learn isn’t sufficient cause to remove a teacher. You cannot argue that education is your priority when you assign students to teachers like these. Myth #3: Under no circumstances will we negotiate the safety of our students. There’s no mandatory retirement age for school bus drivers. Think about that the next time a substitute driver is used to bring your kids home. Myth #4: The more training a teacher gets, the better teacher he becomes. According to the study, having a master’s degree in teaching is more likely to impair than improve a teacher’s performance. Meanwhile, the majority of our teachers are getting their master’s degrees in “Curriculum Studies”. This is essentially a master’s degree in developing a lesson plan and they get the same $10,000 salary boost for their master’s plus 30 as the teacher who gets a master’s in history. Let’s compare the average teacher with a master’s degree in education to a recent college grad who’s only training is a five-week boot camp sponsored by Teach for America. A recent Wall Street Journal editorial reported that an Urban Institute study found that “[o]n average, high school students taught by TFA corps members performed significantly better on state-required end-of-course exams, especially in math and science, than peers taught by far more experienced instructors. The TFA teachers' effect on student achievement in core classroom subjects was nearly three times the effect of teachers with three or more years of experience." Myth #5: Teachers are underpaid. Who would argue that baseball players should be earning more than teachers? Well, anybody who believes in a market economy would. Considering how many qualified applicants we have for every open teaching slot in our schools, any economist would say we’re paying above the market rate. Compare their salaries, generous healthcare and pension benefits, summers off, and schedules that match their children’s, to workers in the private marketplace, or even to teachers at private schools. A corollary to this argument is that you need high salaries to attract highly qualified people. Well, please refer back to the Wall Street Journal editorial – “Eleven per cent of Yale's senior class, 9% of Harvard's and 10% of Georgetown's applied for a [Teach for America] job whose salary ranges from $25,000 (in rural South Dakota) to $44,000 (in New York City).” Yup, these college grads turned down jobs in corporate America to become public school teachers in some of the nation’s roughest districts. Myth #6: Performance incentives would not improve education. The educrats would have us believe that performance incentives work in every industry around the world except in education. Teachers unions are so horrified by the concept of merit pay that, in Seattle, they rejected education grants that would have given teachers over $2.5 million in performance bonuses. Given a thousand dollars to spend, which do you think would have a greater impact – having a teacher take another training course or offering the thousand as a bonus for higher student performance? Next time we talk about our public schools, let’s try to keep it real. >>> Read more! Is Aberdeen Township’s all-Democrat council sensing the end is near? How else to explain the sudden rush to break the bank? In the past month alone, the township has awarded $237,071.25 in no-bid contracts to CME Associates and approved another $957,383 in “emergency” appropriations. All this on top of the township’s largest tax increase in history coupled with its largest asset drawdown in history. Question is - will they leave anything for the rest of us when they’re gone? First, a quick recap of the budget mess. Shortly after winning the election on a platform of “fiscal responsibility”, the township raised taxes by a jaw-dropping 12%. Before considering any “emergency” appropriations, this year’s $15.3 million budget is an 8.8% increase over last year’s $14.1 million budget (Sheet 11). Include emergency appropriations, and the township will be spending $16.3 million, a breathtaking 15% increase over last year’s $14.2 million (Sheet 3a). Take another look at that number. Assuming there are no further “emergency” appropriations, we’ll be spending 15% more than last year. At that rate of increase, the municipal budget would double every five years. As for the state mandatory 4% CAPs, the township found a nifty way around that. Under New Jersey State law, “the governing body may, by resolution adopted by a 2/3 vote of the full membership thereof, make emergency temporary appropriations for any purposes for which appropriations may lawfully be made.” (40A:4-20) So, by a supermajority vote, the township can make any “emergency” appropriations and these appropriations are not restricted by state CAPs. Furthermore, an emergency is whatever the township calls an emergency. Meanwhile, the difference between a simple majority and a 2/3 supermajority on the town council is just one vote. Then there’s the recent bonanza for CME Associates, “coincidentally” the largest donor to the Aberdeen Democratic Executive Committee - $237,071.25 in no-bid contracts. Let’s be clear – it is a complete abrogation of fiduciary duty to not seek lower bids from competent parties when reasonable to do so. $13,081.25 for an “Aberdeen Recreation Master Plan”. $14,250 for engineering services on the former “Ernst Zobel Company Site”. $127,990 for the “Stabilization of an unnamed tributary of Mohingson Brook”. $63,000 for “ADA Accessible Sea Wall Park Improvements”. $18,750 for the “Preliminary Assessment & Limited Site Investigation for Sea Wall Pedestrian Access Project”. Once again, take another gander at these proposals. CME presented a proposal for an Aberdeen Recreation Master Plan on November 12th, 2007. All the other proposals are within the past two months. In other words, this proposal was rejected by prior management (i.e. Stuart Brown) and then reconsidered and approved after his departure. The Ernst Zobel Company Site is a piece of land that has been slated for the transit village project. But there is no development on the transit village project. What could the township possibly be doing that couldn’t wait for a developer to do on his dime? None of the other three projects require any intimate knowledge of the township and could certainly be done for less through competitive bidding. I wonder why they need to be done at all amidst skyrocketing taxes. The level of reckless spending is unusual even by our council’s spendthrift standards. Is this a last gasp to solicit even more campaign contributions or has the council chosen to go out with a bang? Whatever the case, this council sure does enjoy spending other people’s money. >>> Read more! As my detractors fondly note, I’m no expert in public finance. In my world, two plus two equals four. Apparently, that type of math doesn’t extend to public school finance. First, there was the proposed school budget, where the administration tried to raise taxes by the absolute legal maximum and then marketed the proposed tax hike as a sign of fiscal restraint. Next, the administration chose to increase maintenance costs by postponing needed roof repairs and then budgeted these additional costs as a spending cut. Now, we’re left wondering how much the district actually cut healthcare benefits for teachers. At the last BOE meeting, I asked the board whether the ratified teachers contract included employee contributions to healthcare benefits. Under advice from the board attorney, Board President Pat Demarest refused to answer. I assume they’re referring to the State Health Benefits Plan – NJ Direct10. The plan is similar to an HMO that gives full reimbursement for in-network and partial reimbursement for out-of-network. Considering the plan is administered by the state and the state has a “friendly” relationship with the teachers union, I assume it’s a good plan. It should be at a "discounted" rate of $1,035.75 per family per month. So, I should be thrilled. $750,000 is a lot of money. I’m not. On April 13th, I wrote “It's possible that the teachers have simply agreed to a less expensive benefits plan but even that would be notable.” I was being both cautious and generous. Cautious because I was under the impression that the teachers had agreed to some kind of contribution towards their own healthcare. Generous because I’m highly suspicious of this “savings”. Also, if you compare the 2007 and 2008 budget summaries, you’ll see the appropriations for benefits in 2006 exceeded actual expenditures by nearly $250,000. The following year, appropriations were then increased by $200,000 above the original projection; it appears the surplus money was shifted from one year to the next. Discounting the $200,000 surplus, the benefits savings is reduced to $500,000. If they use that surplus to cover a deficit, then the savings is reduced to $300,000. Meanwhile, despite claims of fiscal restraint, despite employee healthcare contributions by all staff excluding faculty, despite the $750,000 “savings” from the new healthcare plan, spending growth for general operations is accelerating. The general operations budget grew 4.5% in 2006, 4.9% in 2007, and 6.4% in 2008 (page 5). How does the school district finance such spending increases while remaining within the state mandated 4% cap? Easy. The administration slashed capital spending by 56.5% (page 5). That was assuming the roof in the administration building would be replaced. Since that’s been postponed, capital spending has dropped 81.6% to a measly $274,224. As there’s no more money to cut from capital spending (and the buildings will literally fall apart at their current level of financing), where will they cut next year? Well, the biggest budget items, in order, are salaries, benefits, and building maintenance. Care to guess where the administration is likeliest to cut next? Yup, I’m no expert in public finance but this sure doesn’t look to me like fiscal restraint. In my world, two plus two still equals four. >>> Read more! Wow. 88 houses, more than double anyone’s expectations. By most measures, the Greater Aberdeen Garage Sale was a success but there were definite shortcomings as well and lots of room for improvement. However, I first need to thank everyone who participated. To those who sold and those who bought, I offer my gratitude for reviving our community spirit. Aberdeen has a great future because we have great people and, together, we can do great things. I’d also like to offer my special thanks to the following people: First and foremost, thank you, Erin Stattel, for publishing an article about the garage sale in the Independent. Nothing I did garnered as much publicity as your article. Next, I’d like to thank Sametta Thompson for listing the event in the Asbury Park Press and Alyssa Pessaggio for promoting the garage sale on her blog. Thank you, Karen Ventura, for listing the garage sale on the township website and being a constant help to me in all township matters. Thank you, Mary Giaimo, for creating and broadcasting advertisements on Huskievision. Thanks to all my readers who posted helpful advice on how to improve the event. And thanks to my wife, Jennifer, whose constant support and advice made it all possible. I’m so lucky to be surrounded by such wonderful people. The garage sale had two objectives – To promote Aberdeen and foster community spirit. At the same time, people have garage sales to sell. In that last regard, the garage sale was very uneven. Some people have reported low traffic and dismal sales. Others had an outstanding day. In retrospect, I realize I made several mistakes and hope to do much better next year. First, I believe I overestimated the utility of the maps. While printing addresses may be sufficient for the locals, the out-of-towners need something more. Additionally, many people like to simply drive around and stop at any garage sales they find. Hence, garage sales with more exposure did far better than others. Next, there’s an old business saying – Prepare for success. I wasn’t prepared. When the site reached 80 locations, the browsers began having trouble loading so many maps. Also, the listings weren’t in any particular order. And, I discovered belatedly, the site could only handle 99 addresses. Lastly, word-of-mouth advertising was woefully inadequate to promote the event. Here are some of my ideas for improving the Greater Aberdeen Garage Sale for next year. As always, I’d love to get feedback and suggestions. Thanks again to everyone who participated and helped. Can’t wait to see you next year. >>> Read more!